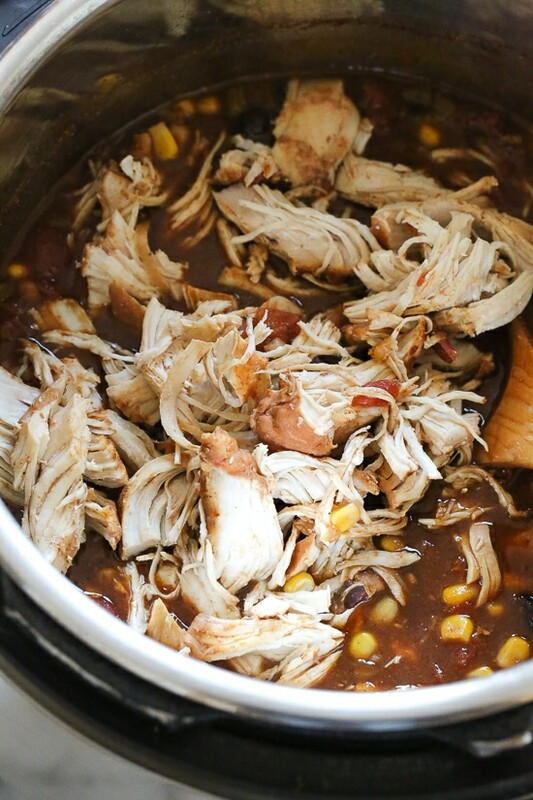 This delicious Chicken Taco Chili recipe, made with chicken, beans, corn, tomatoes and taco seasoning is one of my most popular slow cooker recipes, which I just remade for Instant Pot after several requests! 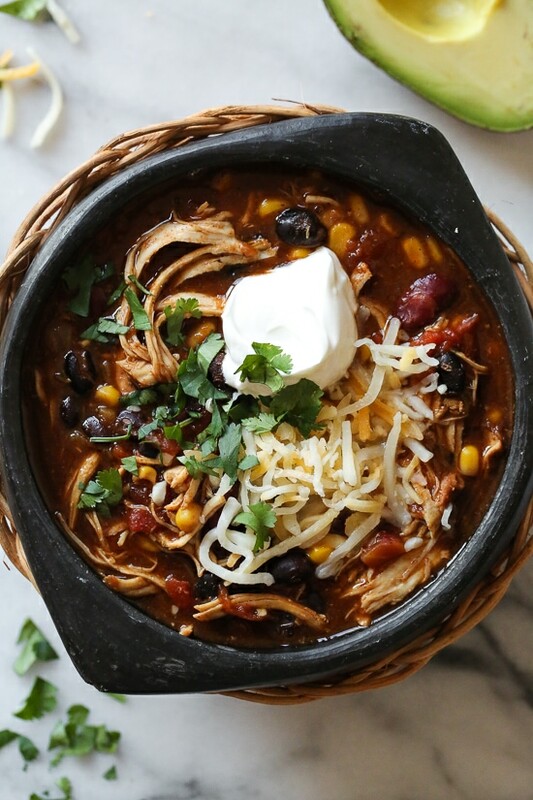 This chicken chili recipe is one of my favorites, and it’s so easy! 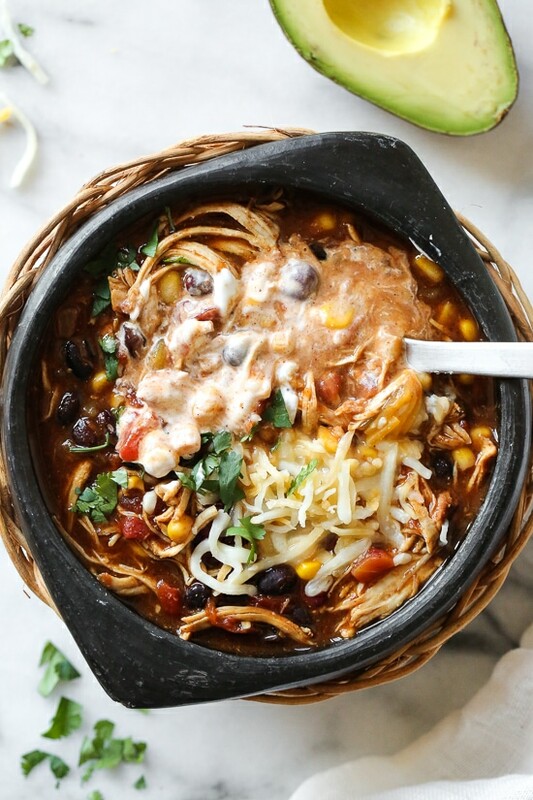 If you don’t have an Instant Pot, you can make the Crock Pot Chicken Taco Chili instead, or cook it on the stove, simply double the cook time over low heat and add a little more water. A sign of a good meal in my home is when Tommy goes for seconds. He doesn’t typically care much for chili, but last night he had two big bowls and told me he loved me, at least a dozen times, I guess you can say dinner was a win! I’ll be honest, this came out even better than it does in the slow cooker! The chicken was tender and the flavors were spot on! If you’re on Weight Watchers, a big bowl of this chili is 0 Smart Points without the toppings. Since I had plenty of points left, I added some good quality cheddar, sour cream and avocado on top, but feel free to add whatever topping you wish! Other suggestions, scallions, chopped red onion, Greek yogurt, to name a few. You can use premixed taco seasoning or make your own using spices most of you have in your pantry, I provided directions for both options. Leftovers are great the next day or you can freeze them for another night. See more Instant Pot recipes here. After you saute your ingredients, press cancel to shut off the heat so it doesn’t continue heating up. When using the saute button always deglaze the pot after sauteing with some water or broth before adding your other ingredients and use a wooden spoon or spatula to remove any food that may be stuck to the bottom. Make sure the sealing ring is installed properly, if not steam will escape and scorch the food on the bottom of the pan. Make sure your steam release button is set to sealing, not venting so steam does not escape. Recipes containing tomato sauce or puree, tend to scorch on the bottom while the Instant Pot is coming to pressure since they are not thin enough to build steam. The best solution is to layer the ingredients so the tomatoes are last, on top. Also, not stirring may help avoiding the burn notice. I hope these tips help, please let me know if you are still getting the burn notice, this didn’t happen with my older model so I am trying to figure this out! 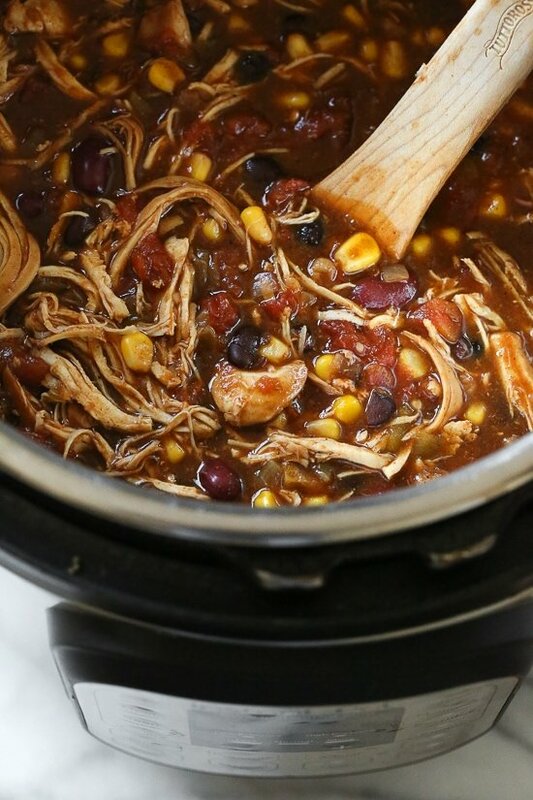 Chicken Taco Chili, made with chicken, beans, corn and tomatoes seasoned with taco seasoning is one of my most popular slow cooker recipes, which I just remade for Instant Pot after several requests! This recipe couldn’t be easier, made with ingredients you probably already have in your pantry. Add the chicken and season both sides with half of the taco seasoning. Add the beans, corn, green chilies, then finish with the diced tomatoes and tomato sauce. Add 1/2 cup water plus the remaining taco seasonings and gently stir without moving the chicken. Cover and cook high pressure 25 minutes. Natural release, then remove the chicken and shred with two forks. Return the chicken to the pot and mix to combine. Top with fresh cilantro and serve. Makes about 11 cups. This was very flavorful! However, I also got the burn notice; I have the Instant Pot Max. I think the onions on the bottom are what burned even though I had deglazed as instructed. So upon opening my instapot I stirred things up, despite the directions here, and I also added a bit of extra liquid. That seemed to do the trick. It will be interesting to see if mixing things completely next time will prevent the burn notice. The only criticism I have is that my chili ended up being very high in sodium. That really is more because of the products though. Rotel tomatoes have a ton of sodium; apparently they do make a no added salt version if you can find it. I used the packaged taco seasoning as well and that has quite a bit of sodium. The canned beans also were high in sodium. I had 3 teenage boys with me when I was shopping so I was hurrying…next time I’ll try to find lower or no added salt canned products and make my own seasoning. The meal is delish but using the IP Duo 60 I kept getting the burn notice. I did deglaze before adding the chicken and layered with the tomato sauce last. Even added a little more water after the first burn notice. I cancelled twice after each burn notice and tried to remove any burned stuff from the bottom and then tried twice more with no success. Eventually I just cooked it on the stove. When I poured the food into the stove pot it was clear that tge bottom of the IP had burned remnants of either the tomato or the beans. I dont think the IP is defective but that something needs to be adjusted in the recipe. Either more water, broth. The newer models have this issue, again I made mine with no problem. Adding more liquid will ruin this dish, but layering the water first and tomato last may help. Sorry this didn’t work out for you. How long do you let it natural release? Thank you!! Gina, if I am only doing two chicken breasts (~16 oz) do I need to reduce the pressure cook time? Big fan of Skinny Taste! Made this recipe recipe in the crock pot a few times and loved it! Tonight made the pressure cooker recipe. Excellent! No burn notice! I made this tonight. Yummy! I used two cans of black beans. I got get the burn notice, but I released pressure, gave it a good stir, and made sure the breasts were settled once again on the bottom of the pot. I used the bean setting on my 6 qt Ultra for 25 minutes. I’ve made the recipe several times using my slow cooker. I’m curious why in the slow cooker recipe the kidney beans and black beans are drained, but not when making the IP version. Do you use Mexican style tomato sauce such as El Pato? Or regular tomato sauce? I use regular, but I’m sure that would be good as well. Hi, when I added up al the canned items on WW smart points calculator it shows this reciepe as 15 SP. Just wondering how is it 0points? Am i calculating wrong? New to this. Thanks. Currently recipe being made in my IP! Hi Sam. Are you using the recipe builder? The only accurate way to determine any recipe’s SmartPoints® value is to plug the ingredients into the recipe builder on the Weight Watchers website (Click on “My Foods,” select “Recipe,” and click “Create a recipe.”) which does not count fruits and vegetables in recipes in the calculations as they are now 0 points. Excellent! I don’t want to be one of those who changes ingredients, then rates a recipe, but I had no choice to use what I had this day and I feel others might benefit to know that so they know this recipe is very adaptable. No black beans = used Navy Beans, No frozen corn=had canned drained kernel corn, Had no chopped green chili peppers = sadly had to leave out (next time-love them! ), No fresh cilantro = used dried cilantro in the cooking chili. Now the Taco seasoning: I’m a lazy cook but wanted to make the homemade mix. So tasty and I’m really glad I tried it! Had no onion powder = used chunkier onion flakes. Tried a Hot Paprika as we like spicy. Instead of the 2 water additions, I used “Better than Bouillon”Roasted Chicken Broth because I’m obsessed with it and use it (or the Beef one) instead of water in the IP all the time. I also added mushrooms (we enjoy them in any chili). I did get a couple of Burn notices (de-glazed well after onions with a flat edge wooden spoon), but I tried quite a vigorous additional de-glaze after Burn #2 and used the Bean/Chili button the 3rd time for about 20 min. and it worked a charm (Tip: Wooden spoons work hard and are gentle on your IP liner). I was easily able to fork shred the chicken breasts right in the pot without removing or even touching the liner, they were that tender! Served piping hot over a few crushed tortilla chips, a light touch of grated cheddar, a sprinkling of chopped green onions and a dollop of sour cream. A definite make again. I have made the crock pot version many times. Tried this one for the speed. Mine came out very soupy? I’m trying not to slow cook it to get rid of the liquid. Any idea where I went wrong? Mind did as well – I added a slurry at the end and that helped some. I also didn’t let it fully natural release as I got impatient. Also, I would say that “Total Time” is closer to an hour or even a bit over as it took at least 20 minutes to pressurize and over 20 minutes to release. Still tasty though! I would like to make this on the stovetop in my Le Crueset Dutch oven….what would be the total amount of water to add and total cooking time on low heat? Wow… just made this today as my second recipe in my IP . I have the Lux 6 qt.This was FABULOUS…. and I did not get the burn notice like many others… I did follow Gina’s hints to the letter.All in all less than 1 hour! Love it! Have made twice in IP- excellent both times. I used a whole can (28 oz) of regular diced tomatoes instead of the 2- cans of diced tomatoes with chili’s. Probably used more onion since mine were larger and only ended up using with two chicken breasts instead of three. Both attempts were so well-received and a really easy dish to make! This is my go-to recipe when I need a night off. It’s simple, delicious and one of the few recipes everyone in my family loves. Plus, its great for lunch the next day. Since my husband had two bowls would he need to add points for weight watchers? I always have two bowls. I count 0 points for the first bowl and 5 points for the second bowl. Love love this and so did my husband so he had two bowls! Since we are doing weight watchers and this is zero points should he add points since he had two bowls? In flavor this was definitely a 5!!!!! So flavorful and 0 freestyle points, this will definitely be in the rotation.However, I thought about knocking it a star because we got the burn warning even with deglazing the bottom. Had to add about another half cup of water to get it to work. If you have a newer model, and are crunched on time maybe just start with more? How much premade taco seasoning do you use for this recipe? I made this recipe for my husband and I and we LOVED it! I have another chili recipe that I’ve made for a long time but my hubby likes this one more so it’s going to be my go-to. Thanks Gina! You don’t drain the beans in this instant pot recipe and you do in the crockpot version. Any reason?Just thinking of the additional sodium. I prefer the thickness you get when you don’t drain them. Just made this for dinner last night. It’s outstanding! My hubby, who normally doesn’t like taco flavored things, loved it too. I’m guessing it’s because of the homemade taco seasoning instead of the pack. I just got my Instant Pot in January, so it’s pretty new, and I did not have any trouble with the burn notice. I did make sure to get every speck of brown off the bottom of the pot when I deglazed, Thanks for another delicious recipe that will go in regular rotation around here (along with the turkey stuffed peppers :)! This is my new favorite taco chili recipe! The chicken is pull-apart tender and awesomely seasoned. My son ate 2 1/2 big bowls of it! It’s also wonderful reheated. this came out sooo yummy and delicious! followed the recipe exactly, except didn’t have enough seasonings – so i used a full packet of trader joe’s taco seasoning. thank you gina! second recipe i’ve made in my instant pot and i’m getting the hang of it (maybe?!) but this turned out perfect! can’t wait to eat the leftovers of it all week. didn’t have a burn notice like some others are saying. My family and I love this recipe! Both because it takes so yummy and because of the point value. I have a question though. I am thinking about going back to an old WW plan- points plus. I was wondering if you could consider adding old point values along with freestyle at the end. I see point + was there but no value next to it. It would be very helpful! Just to note… your recipes are a staple at our house. I don’t think I have tried a recipe that we don’t like. Sure, all recipes have freestyle points and should have points plus. I have updated this recipe with it. Took way longer than the actual time stated. Great recipe but more soupy than I prefer. I ended up thickening it with cornstarch to get the chili consistency my family prefers. 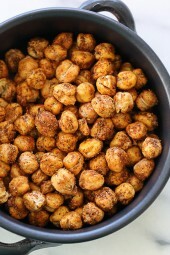 Great 0 point Weight Watcher recipe! I made this and it came out really good but I had some problems. I did change the recipe a bit, I only had extra large onions and a larger bag of corn but I figured it might be good that way anyway. The only problem was I got about three Burn notices. Which is an extreme hassle. So I might have overcooked it but it still tasted good. I also added a little cornstarch after it was done to thicken it. Next time I might use the trivet inside of it and see if that helps, I have the 8 quart which is very sensitive. I might also add a jalapeno. On day 2 I put it over lettuce and added a little cheese and Tostitos on top to make a taco salad. This is the first time I had trouble getting my instant pot to come to pressure. It was because I did not follow the directions and deglaze the onions from the bottom of the pan before putting the chicken in. (Boy, it’s been a long day!) 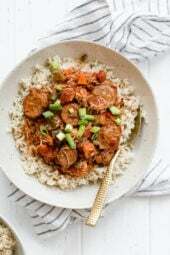 Once I did that, my instant pot came to pressure and everything was great! Dinner a little later than usual, but delicious! So, the moral of the story is…deglaze people, deglaze. Have a wonderful week Skinnytaste peeps! I loved this! It was so much better than a few other tortilla soup like receipts. I think it is better because I made the taco seasoning with the spices in the recipe and didn’t substitute with store bought. I also used pint beans in place of kidney beans because I don’t like kidney beans. I used 2% cheddar and plan greek yogurt and got my weight watchers points even lower! 🙂 It was super easy to make, I did not get a burn notice, but i did shut off the pot after sauce while i added ingredients before I turned on pressure cook. My non-dieting friend loved it too! I made this last night and it was AHHHMAZING!! I did get the Burn notice about three times and got a little worried but decided to ride it out to see what would happen. I opened after third time and stirred then locked it back. After prayers and cheering, it finally came up to pressure. Turned out wonderful and my family devoured it. Thanks so much for the IP recipes! Keep them coming! Do you think I can make this with ground chicken instead? Just cook the chicken first? So good! How long would you say it’s good in the fridge for? I hate when people leave a comment w/o making the recipe…sorry, but I love your Ajiaco bowls, I bought mine in Colombia! and am going to make this and pull them down! The crockpot version calls for 1 T. cumin and 1 T. chili powder, but this one doesn’t – is that on purpose? It didn’t need it, but of course you can add it. Is it possible to make this on a stovetop? If so should o change or add anything? Sere cook on low covered and double the time. It may need 1/4 cup more water. This was FANTASTIC!!! 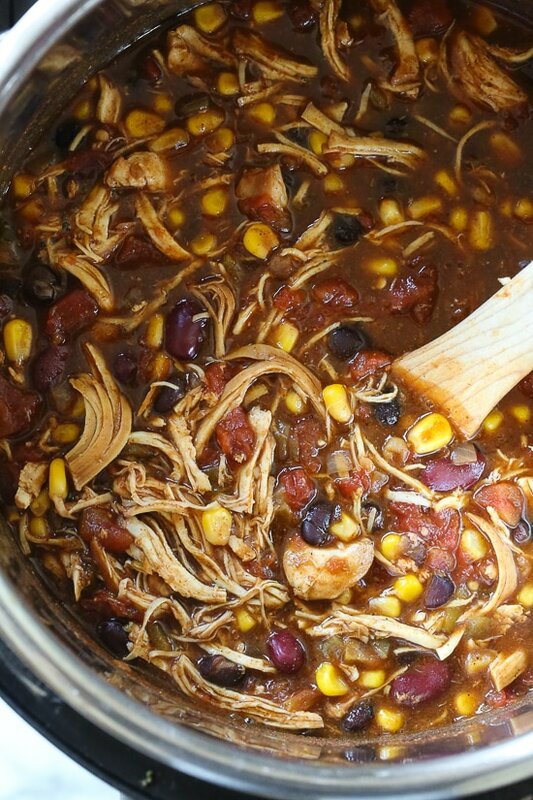 My new favorite chili… Great flavor, filling, and very easy to make. Will definitely be making this again! I made this overnight for dinner last Sunday with the help of my 4yr old grandaughter fun and easy. I made the taco mix whoch is better than using the pre-packaged seasoning.. I put it over califlower rice. So good! The whole family loved this recipe! I will probably have to make a double batch next time so I can freeze some! Absolutely delicious. I sautéed the onions in a pan then followed the directions as written after that. Thankfully there was no burn message. Will be a regular cold weather recipe for sure. The 45 minute total cook + prep time is too low-it took half an hour for the instant pot to get to pressure. Then another 25 of cooking time….plus the time for the natural release. So you need to budget more than 45 minutes to make this-but it’s definitely worth it! Has anyone tried this adding peppers or mushrooms? New Instant Pot user here! My Instant Pot doesn’t let me change the manual setting to high, is it the same to use the Soup setting on high or should I just use the manual default mode? I have the ingredients in the pot now on manual mode so we shall see if it works out! Not sure, that never happens to mine. Instant pot newb here so this is probably a rudimentary question. Should this be cooked on the chili function or the poultry function? I made this as soon as it came in e-mail. I have a new Crock-Pot Multi-Cooker that I’ve enjoyed learning to use. This chili is easy to make and is delicious. I already had most of the ingredients. Love that it’s 0 Freestyle Points! Hubby loves it too! We love everything I’ve made from SkinnyTaste! Made this for my family tonight and it was soooo good! Came out perfect, the only thing I added was a green pepper that I needed to use. I followed your directions on how to not have the burn notice come on, and it worked! I’ve had it happen twice before this, so thanks so much for the tips!! HI Gina, I’m making this now on the stove-top and I notice that in your slow-cooker recipe you drain the beans, and this you don’t. Any advice for the stove-top version? If I use purchased taco seasoning, how much should I put in? I made this for dinner tonight and it took FOREVER to pressurize. Fearful for a mutiny around the dinner table, I let it do natural release for 10 minutes and then did quick release. While it was really good, it was definitely more soup like than chili. Is this because I did quick release? I must have had a huge chicken breast because after 25 minutes one of them was not even close to being done….trying another ten minutes. Hey Gina, just curious: Have you ever considered getting a converting tool on your website so a person could convert the metric ounces to imperial? 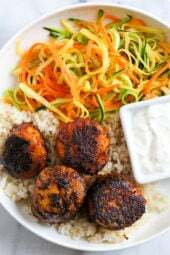 Love your recipes – I’ve eaten them everyday for months and I’m making this tonight! I made it this afternoon with frozen chicken, same cook time & it was a breeze to shred. Every time I make a chili in the IP, my chili always comes out soupy. What am I doing wrong? Any suggestions? We tried this tonight with our Instant Pot Ultra and had to give up. Three burn warnings later, we just moved it to the slow cooker for dinner tomorrow. We followed the instructions exactly, thoroughly deglazed after sauteeing, lots of water/liquid, tomatoes and tomato sauce in last, only gentle stirring, etc. Bummer! This chili was delicious! I used smoked paprika and jalapeno peppers. I will definitely be making this recipe again. I agree and would only cook it for 8 minutes. I’ve made this recipe in my IP for several years and only cooked it at 25 minutes the first time. Way overdone. Do you think the green chilies could be replaced with bell peppers? Or what would you recommend replacing them with? Maybe a banana or cubanelle. Do I need a large instant pot? My niece gave me a 3qt one. Is that too small for your instant pot recipes? I have a 3 quart. I just halved the recipe. It fit in there perfectly. Did you post instructions for how much taco seasoning mix to use instead of spices, if that’s what we want to use? It’s mentioned in the blog post, but I don’t actually see it. Thank you! I know some of you are having issues with my IP recipes. I never get the burn message when I test a recipe, so trust me I am as frustrated as you are. After doing some research, this is what I found- The newer IP models have a hair trigger burn sensor that can’t tell the difference between a slight caramelized residue, which is good, and totally burnt. To avoid this, when using the saute button always deglaze the pot after sauteeing with a tablespoon or two of water or broth before adding your other ingredients.” Hope this helps. Looks yummy! Do you put the chicken in whole or do you need to cut up? Just made this recipe this weekend. Put the chicken breasts in whole. When done with cooking, remove and shred chicken with two forks. 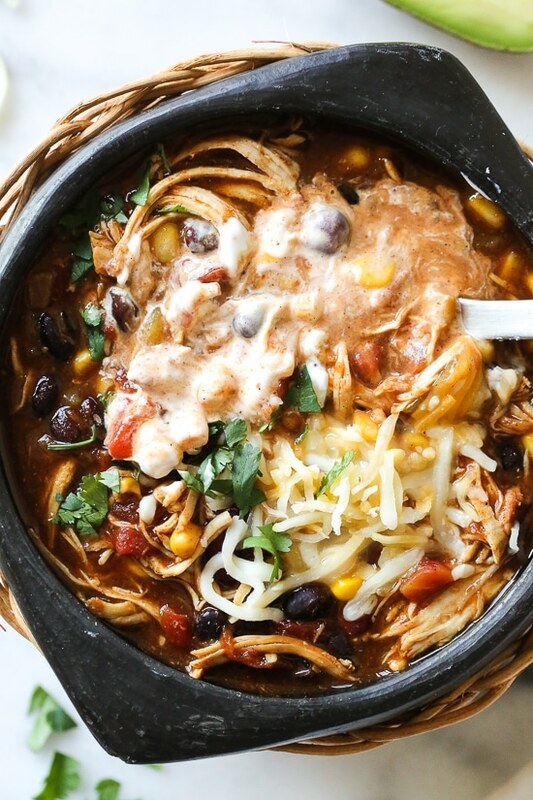 Return shredded chicken to chili. Love your blog and cookbooks! Yes, it adds an extra pan to clean. But my skillets clean easily and now I never worry about getting the burn notice. Plus, I can see exactly when ingredients are sautéed to perfection and it’s easier to deglaze with whatever I choose. Just a tip some may find convenient. Why do you not rinse the beans? If using pre-made taco seasoning, how much do you use? Is the paprika smoked or sweet?? Omgosh!..this is one of my favorite WW Soups. Thank You so much for converting the recipe to the Instant Pot & including your recipe for the taco seasoning.. I too kept getting the burn mssg on my 8 QT Instant Pot Duo no matter what I did.. I returned it to amazon & replaced it with a/ the 8 QT Lux.. so far so good, I’m not getting that notice any longer.. I’m going to make this recipe for dinner tonight.. how yummy it’s gonna be wit this FREEZING -7° weather we have today in ILLINOIS..
Can u make this with precooked rotisserie chicken? If so should the time be cut in half? I guess, but seems like more work. Yummers! This taste like chicken tortilla soup…!!! I put in a squeeze of lime and a small dallop of plain greek yogurt. So easy and super delicious. Kid friendly, family friendly, and freezer friendly. Sadly, I could not get this work in my instant pot. Kept getting the burn alert. Normally, when this happens I can extra liquid (after emptying and cleaning the insert) and restart bringing it to pressure. After adding another cup and half of water, and getting the alert for the third time, I moved it to the stove top. I haven’t had any trouble with the other two instant pot recipes I’ve tried from here. There’s something about using chicken breasts vs. ground meat that causes the problem in my pot. So weird and frustrating this happens to some people. Which model do you have? I wonder if using the rack can avoid that issue? It’s the Instant Pot DUO60 V3, purchased at the end of 2017. I didn’t try the rack this time but have with the other recipe and it still triggers the “burn”. The other recipe I have trouble with has chicken breast, a taco seasoning packet, and salsa. If I had a lot of chicken broth it will work but i’ve decided it’s easier to just throw everything in the slowcooker. This was delicious when I pulled it off the stove! Mine did the exact same thing. I have an 8 quart. I added extra liquid each time and it still burnt three times before I finally gave up. Did you leave it on saute the whole time by accident? Loved the crock pot style, will definitely try this as well. Quick question since I am newer to the insta pot stuff. When you “deglaze” with water, do you leave the water in there or remove it after step two? leave it. Pressure cooker requires liquid to cook. Love your recipes! Would using canned corn instead of frozen be be ok ? Or would texture be a problem? I received a Instant Pot Mini for Christmas. The majority of the recipes I find do not specify whether it is for an 8qt, a 6qt or a mini. I am finding it difficult to adjust a recipe like this to a mini. Any suggestions? I have a 6 quart, so I am not sure how small the mini is but this would probably have to be halved. Hi! Could this recipe be done with frozen chicken? How would you adjust timing, etc? Thanks for all of your amazing recipes! Sure I think same time. I was wondering the same thing. Did you try it with frozen chicken breast? How did it come out? Yay!!! Your crock pot version is a staple in my home, but it takes so long to make. I will definitely be giving this one a go! I am curious why you left out the extra cumin and chili powder in this recipe compared to the other. Thanks for making this, can’t wait to try!! I LOVE the original recipe and since I always had an IP instead of a crockpot I just used the Chili mode. Looking forward to trying the recipe again with these IP directions!